Working in the hospitality industry can get challenging. After all, you face fierce competition, always vying for the same customers as your toughest rivals. Therefore, you need to come up with innovative ways of appealing to both existing and potential customers. If you own a hotel in New Jersey or New York, you want your guests to feel excited about staying at your establishment from the minute they walk in until the time they leave. Most people who stay in hotels make a first impression by what they see in the lobby. For that reason, it is essential that you offer them something unique and unexpected. A perfect solution is concrete wood furniture. That consists of two things: first, furniture designed and built using a combination of ingenuity and specialty concrete. WoodForm Concrete®. creates pieces that have a wow factor and makes for a profound statement. 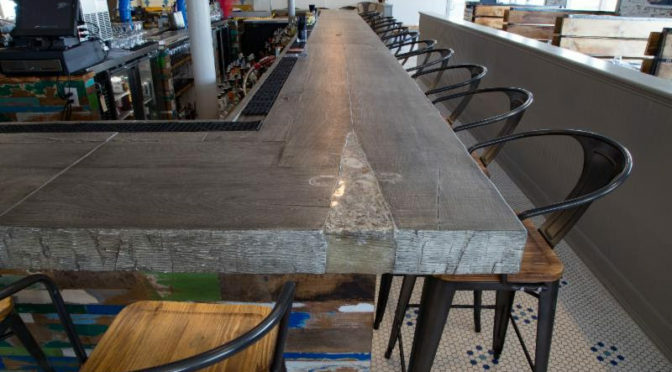 For any hospitality business, whether a hotel, restaurant, bar, nightclub, travel agency, event and conference venue, or something else, concrete wood furniture is the perfect addition to the overall design. This furniture is not only gorgeous but also practical. For instance, if you have a lodge in the countryside of New Jersey where people come to relax and fish, you can make their stay memorable with a bar top complete with embedded fish fossils highlighted with backlighting. However, if you have a New Jersey nightclub, you want something that will entice people inside and keep them coming back. In this case, you could have concrete wood furniture in the form of a bar that features bright fiber optics in an assortment of colors and shapes. This furniture is also perfect for a day spa or hair salon. A desk outfitted with fiber optics will get the attention of passersby and have your regular patrons eager to return. For chairs, sideboards, dining room tables, countertops, fireplaces, and a host of other things, concrete wood furniture will never disappoint.